There is probably no area of activity more in need of reliable dispute resolution procedures than construction projects, especially if more than one jurisdiction is involved. The second edition of this eminently practical guide greatly facilitates the process for all parties concerned. The text, now updated to include the latest edition of arbitral rules, considers the full range of available dispute resolution methods, including mediation, conciliation, and (increasingly common in international construction disputes) determination by dispute review boards or expert panels, before focusing specifically on arbitration. The book then looks in detail at all aspects of arbitration, from commencement of proceedings, through preparation and collection of the evidence necessary in complex construction cases, to common procedural issues, the conduct of the hearing, the effect of the award, challenges to it and its enforcement. coverage of particular issues thrown up by complex construction disputes which differentiate them from other commercial disputes, with guidelines on how to approach such issues in the presentation before a tribunal. As an easy-to-use resource for both general counsel and the lawyers in private practice, this book has no peers. It has proved to be of particular value to commercial contract negotiators and corporate counsel who may have many years of experience but have not had to live through a construction dispute or manage a construction contract during the life of a project. Lawyers in private practice embarking on a construction dispute for the first time will also find this book of value, as will students of dispute resolution. Acknowledgement to the Second Edition. Chapter 2 Key Features of Construction Contracts. Chapter 3 Dispute Avoidance and Resolution. Chapter 6 Forms of ADR. Chapter 7 Commencement of an Arbitration. Chapter 8 Control of the Arbitration. Chapter 9 Preparation and Collection of Evidence. Chapter 12 The Conduct of the Hearing. Chapter 13 Effect of the Award. 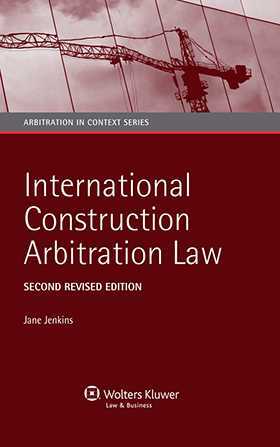 Chapter 14 Investor-State Arbitration within the Construction Sector. Annex 1: Dispute Resolution under the FIDIC Silver Book. Annex 2: Dispute Resolution under NEC3 Option W1 and W2. Annex 3: Sample Institutional Flowcharts. Annex 4: Important Drafting Considerations for Dispute Resolution Clauses. Annex 5: Sample Multi-Tiered Dispute Resolution Provisions. Annex 6: Example Outline for Request for Arbitration under the LCIA Rules (1998). Annex 7: Example Outline Terms of Reference under the ICC Rules (2012). Annex 8: Example Redfern Schedule for Disclosure Requests.